I have been begging for collecting selvages for a while now. And blogging friends have been very generous. To show my appreciation for their kindness, I made them each a pincushion out of some selvages and mailed them off before Christmas. What I didn't expect was for a couple of them to write a post about it (here and here). 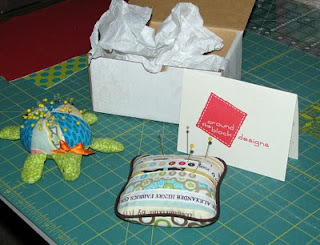 Terri and Allisa each have great etsy shops, too, so take a minute and check them out. The bonus of 2009--new friends and constant inspiration--and more to come in 2010. Just came over from Allisa's blog! Your pin cushions are gorgeous, what a kind gesture to send them out! I have been keeping selvages for awhile but don't have the patience to sew with things that little...just was tired of wasting them after seeing all the blogs that people were doing things with them. Anyway, if you want a baggy full, could you email me your address and I will send them to you. That way I won't have to move them in a few days. my email is meek1mccoy@yahoo.com. I would love to get them to you if you can use more!